This Mango Milkshake is perfectly creamy and delicious for hot summer days. Learn how to make the best mango milkshake. 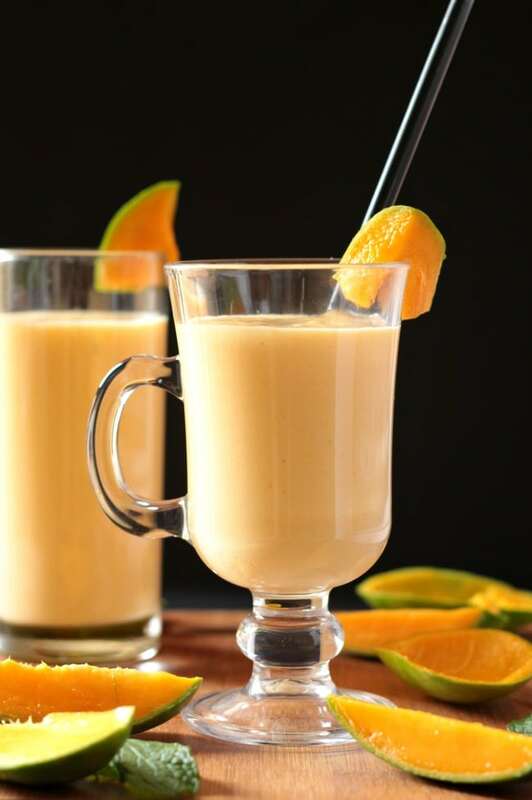 Read on to find out how to make this mango milkshake vegan, and also which mangoes are the best for this mango milkshake. 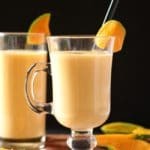 This Mango Milkshake recipe is a perfectly creamy and thick and well suited for the upcoming summer. Wait, cross that, because summer isn’t coming, it HAS arrived. Well at least in the middle east it has, and boy has it come with a vengeance this year or what? Actually, it does so every year. Anyway. Let’s come back to this mango milk shake, because this is what you’ll want every single day in this hot summer. And guess what? Sugar (to taste and this is optional, especially depending on the sweetness of the mangoes). It’s really easy to make this mango milk shake. Just combine all the ingredients in the blender and whiz away. If you want a thick milkshake then reduce the amount of milk. If you want a thinner consistency of the shake add more milk. If you want to make this mango milkshake vegan, you may use coconut milk or any other nut milk like almond milk. This mango milkshake can be kept completely sugar free, so it really depends on your sweet tooth if you want to add sugar or not. You may use regular granulated sugar or brown sugar. How Do You Make a Mango Smoothie? You can make this milk shake easily into a mango smoothie by reducing the amount of milk a little bit and adding 1/4 to 1/2 cup of plain yogurt. There are over 500 varieties of mango in the world! 500! Whoa. India is the largest producer of mangoes in the world btw. While all mangoes are delicious, for this milkshake you should use a variety of mango that is not fibrous. It should be ripe, and of the juicy kind with a sweeter pulp. Try to use Indian sweet mangoes like alphonso, safeda or dussheri which have a sweet pulp and less fibre. I would not advise to use mangoes that aren’t sweet as the sourness in the mangoes could cause the milk to curdle. Note: This Mango Milkshake recipe was first published on 3rd May 2016 and it’s been updated with more information. 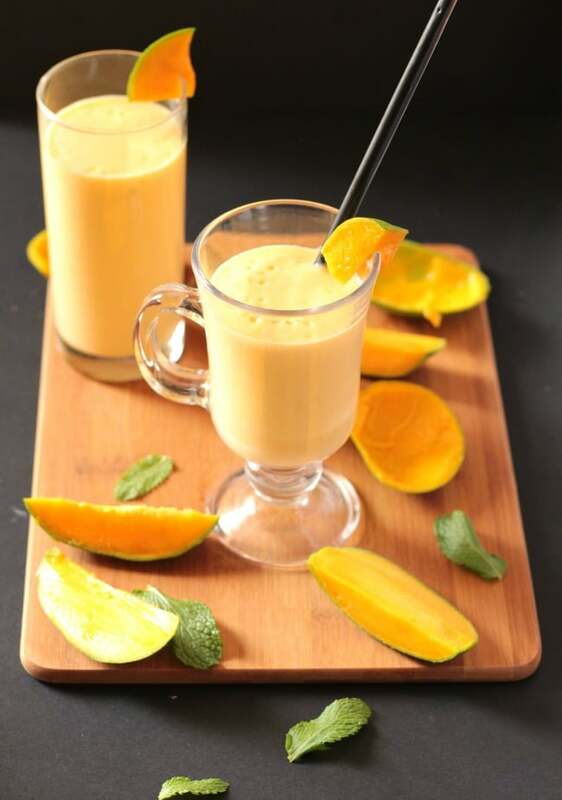 This easy mango milkshake recipe on require 3 ingredients: mangoes, milk and sugar. Find out how to make the best mango milkshake using the best variety of mangoes. Tips included on how to make this mango milkshake vegan. Peel and chop the mangoes. Add to blender. Pour in the milk. The amount of milk can be reduced or increased according to how thick you want the milkshake to be. Blend on high speed for a few seconds until smooth. Taste the milkshake, if you need more sweetness, add sugar as desired. Looking for more perfect summer drinks? Ooooh I almost bought mango at the store today, now I wish I would’ve! This looks amazing, and its super simple! I am SO ready for summer too 🙂 Love all the fresh summer produce and frozen treats! I’m in the same boat as you are! I can go into raptures about mangoes and my love for them too! This looks like the perfect drink, and I wish I had some of those fresh mangoes with me right now! This mango shake looks creamy and refreshing. That Cold Coffee with Ice Cream is totally my kind of treat too! This looks summery and delicious! I love that it is so simple to make. I can’t wait to try it! You had me at mango. I’ll have a glass of this shake please. In the meantime I’ve shared it.